Photo: Early morning light over the Blewett Pass surroundings (taken near Tronsen Head). ATTRACTIONS. The Tronsen Meadow Non-Motorized Winter Recreation Area, located just north of Blewett Pass, is a fabulous resource for skiers, snowshoers, and sledders. 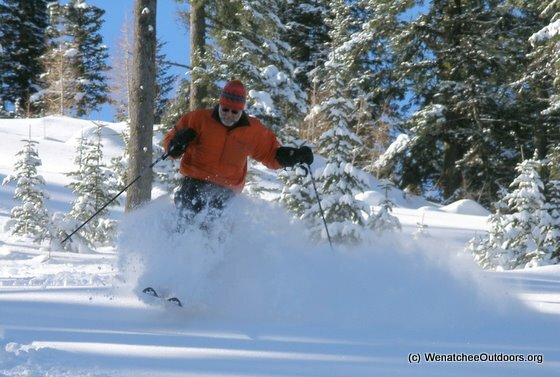 This is not a “groomed” skiing area but Nordic skiers on light-touring gear can explore many miles of snowed over roads (and five to six square miles of woods) without the distractions of throngs of people or snowmobiles. 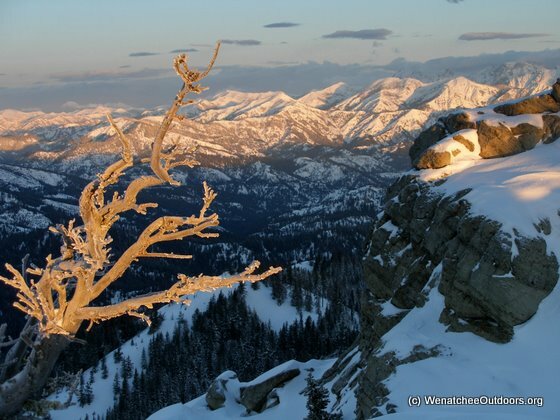 Backcountry skiers will find several peaks to climb with exciting slopes to descend. And fore everyone, there’s good scenery to enjoy—you’ll get many views of Diamond Head to the south; Miller Peak, Navaho Peak and the Enchantments to the west. The Tronsen Meadow Trail (Trail #1205) described in this entry gas quite a confusing name because it doesn’t go to Tronsen Meadow. Instead it heads uphill to Tronsen Ridge and can be used to access Haney Meadow, Mount Lillian, South Lillian, and/or Tronsen Head. Tronsen Meadow, meanwhile, is below and to the west of this trail. So why the name? Beats us — there’s interesting plate tectonics, history, or debauchery involved here. DISTANCE. About 4.5 miles (one way) to the top of Peak 5,980′ (Tronsen Head). ELEVATION: Start: 3,890’. 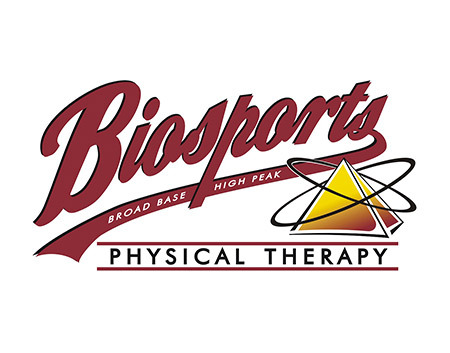 High point: 5,980′. Gain about 2,100 feet. ACCESS. From the Big-Y Junction at the intersection of Highway 2 and Highway 97, east of Leavenworth, drive south on Highway 97. Pay attention to the milepost signs and, about 0.8 mile before Blewett Pass (milepost 164.8), park on the east side of the highway along the plowed shoulder. Forest Road 7240 intersects the highway here. Start skiing up FS Road 7240. In several places, you may notice smaller, steeper roads and trails forking off. Stay on the largest road which climbs at a mellow rate. After about 0.6 miles, the road starts hooking to the right and the pitch steepens. This is the steepest part of the road. 0.8 miles from the start you’ll enter something of a clearing where there’s a major intersection. A large ponderosa pine has blue plaques noting two trail options. The trail going straight ahead climbs over a little berm and follows a smaller road that in 0.3 to 0.4 miles actually enters Tronsen Meadow. For this tour that follows the oddly named trail that doesn’t go to the meadow, follow the main road as it hooks left at this intersection. After another mile, the road enters the parking lot for the Tronsen Meadow Trail (Trail #1205). Follow the trail. The route narrows down a lot now. 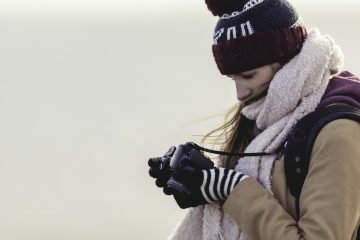 After a few hundred yards, you’ll notice a wooden sign noting the trail goes right and a blue plaque noting the skier’s trail goes straight ahead. Follow the right trail noted by the wooden sign which heads uphill to the higher ridge you’ll be skiing. After 1.5 miles of climbing, you’ll hit the ridgeline. You can turn left and follow the skyline north to Tronsen Ridge. For this tour, however, turn right and follow the skyline south and then southwest for about a mile to reach the summit of Peak 5,980 (Tronsen Head). Options for the return trip: 1) Retrace the trail and road back to the start — best for weaker skiers and when avalanche conditions are worrisome 2) Ski a short way down the east ridge to about 5,800-foot level; then ski one of the gladed/open north-facing lines back down to Road 7245 at an elevation of about 4,800 feet. From here you can either: a) follow this road to the west for about 0.9 miles to the Lillaby Trail intersection (no sign), turn right (north), ski down toward Tronsen Meadow trending north and a bit east to reach Road 7240, and follow Road 7240 back to the start (this is confusing if you’ve not skied here before and we recommend you look at our Diamond Head guidebook entry for more descriptions about this), or b) keep skiing downhill in a northwesterly direction until you hit your ascent road (Road 7240) at an elevation of about 4,350 feet and follow the road down to the start. This second option can be reasonable or terrible depending on where you enter the trees. Photo Left: Descending from Tronsen Head. HAZARDS. The north-facing descents off the east ridge of Peak 5,980’ (Tronsen Head) do avalanche. Ski them only if you have assessed the hazard, have determined the snow is stable, are properly prepared (in case your assessment was faulty), and are willing to assume the risk. The safest entrances onto the north-facing slopes are a fair ways east of the actual summit at about the 5,800-foot level. The trail used for the ascent is the safest descent but even it traverse a few areas that could slide when the avalanche hazard is very high. 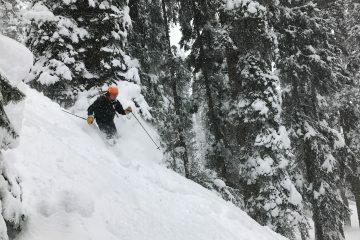 Photo Right: Powder turns near the bottom of Tronsen Head. RECOMMENDED SEASON. Most years you can ski this route from Mid to late December until mind April. USES ALLOWED. Backcountry skiing and snowshoeing. USES NOT ALLOWED. No motorized vehicles aren’t allowed on the trail but are allowed on the ridgeline at the top of the route. FEES/PERMITS. No Sno-Park permit or Forest Pass needed as of 12/2006. MAPS. 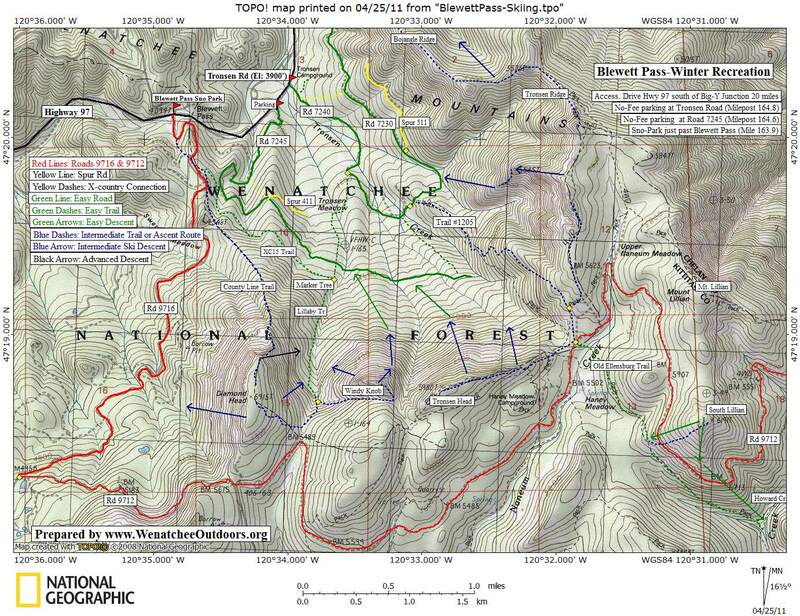 See our topo map below and USGS 7.5-minute Series: Blewett Pass. NOTE. 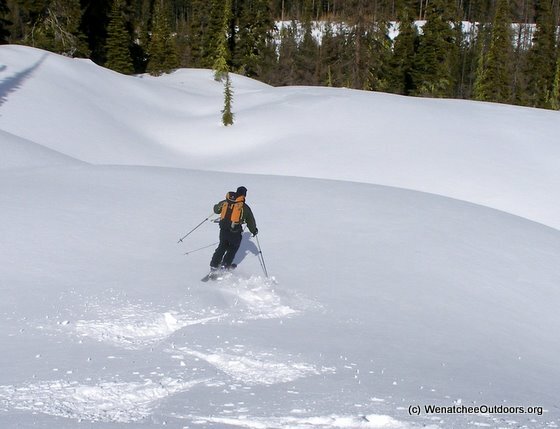 Snowshoers will maintain better relations with their skiing brethren by making their own snowshoeing path beside, rather than over, the tracks skiers have packed. Skis perform much better when they’re gliding inside the channels packed by other skiers.